Heritage Club golf course is a tribute to the rice culture that dominated the land centuries ago. Over 600 acres of giant magnolias, 300-year-old oaks, fresh water lakes and marshes have been transformed into a South Carolina golfing community to rival the finest in the world. 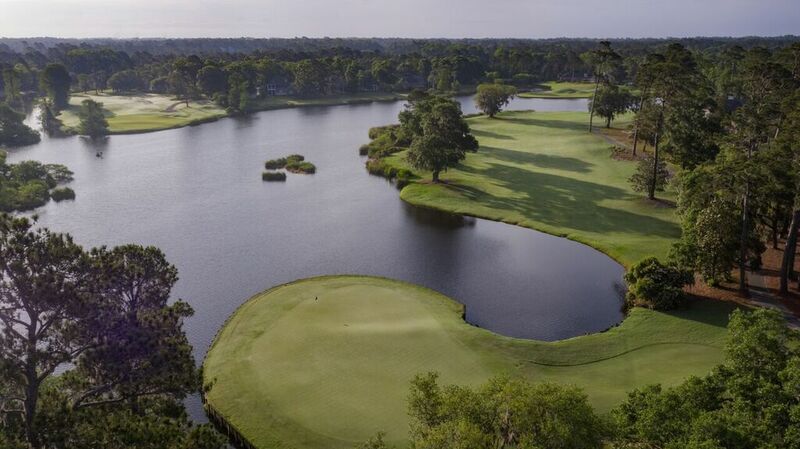 Built on the site of the True Blue and Midway Plantations, the Heritage Club golf course reflects a history of gracious, tasteful living and the charm inherently found in a coastal South Carolina golf course. A magnificent avenue of oaks leads to the Southern Colonial clubhouse overlooking the Waccamaw River. The drive through the entrance to the clubhouse, will leave you in awe at the towering oaks that have grown over centuries in this historic part of Myrtle Beach. Ranked among the “50 Best Public Courses in America” by Golf Digest, the Par 71 Heritage Club golf course, a Dan Maples design, follows the natural contours of the land, stretching out beside long abandoned and historic rice fields. Heritage features spacious, rolling fairways and large, undulating greens, surrounded by lush stands of crepe myrtle, camellias and azaleas. Heavily landscaped areas of wildflowers and flowering shrubs will maintain the beauty of this historical setting for generations to come. As part of the Legends Group, all rounds booked at the Heritage include free breakfast buffet, lunch, and 2 beers or soft drinks. The Legends offers great value, as well as special three and four round golf packages.